A minimalistic set composition of coloured threads is based on a combination and exploration of elements such as line, light, colour and space; this is a work that establishes classic elements of painting in an abstract space. 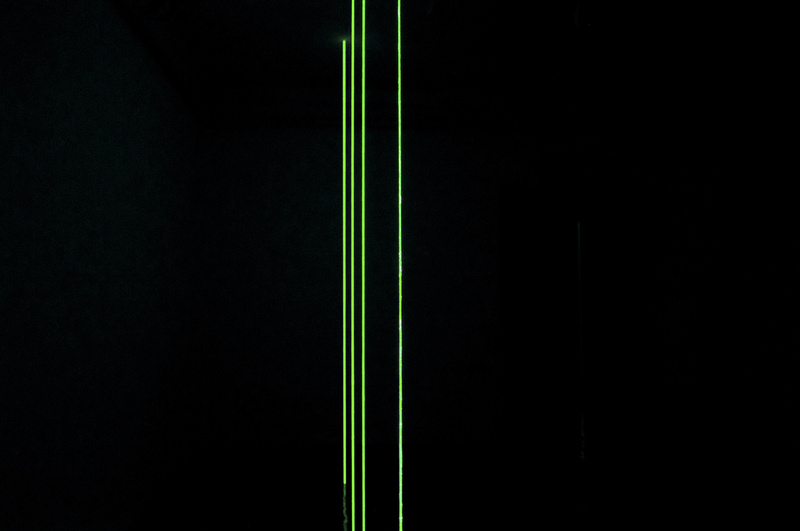 The installation is thus an attempt at creating a three-dimensional work that on the first sight appears a flat two-dimensional drawing but also a reflection of the artist’s ambition to create a visual form that tries to recreate a digital environment with a markedly analogue character (strings, pigments, light etc). The abstract spatial composition that requires some concentration and patience from the viewer, convinces with its reductive aesthetics in search of the imaginary endless space and of its depths. Miran Kreš (1973) graduated in painting in 1998 with the professor Zdenko Huzjan from the Department of Visual Pedagogy at the Faculty of Pedagogy in Ljubljana. His media are paintings, graphics and installations, while the leitmotivs of his works are colour, light, space and the effect they have on the observer. He explores visual forms with colours and shapes increasingly more minimalistic, yet intense in their appearance. He created several independent exhibitions home and abroad while also contributing to many group projects. He lives and works in Ljubljana.